Walker Zanger’s new Byzantium collection is inspired by Imperial Byzantium and Rome. Shown: Agean Sea Thasos and Storm Grey. 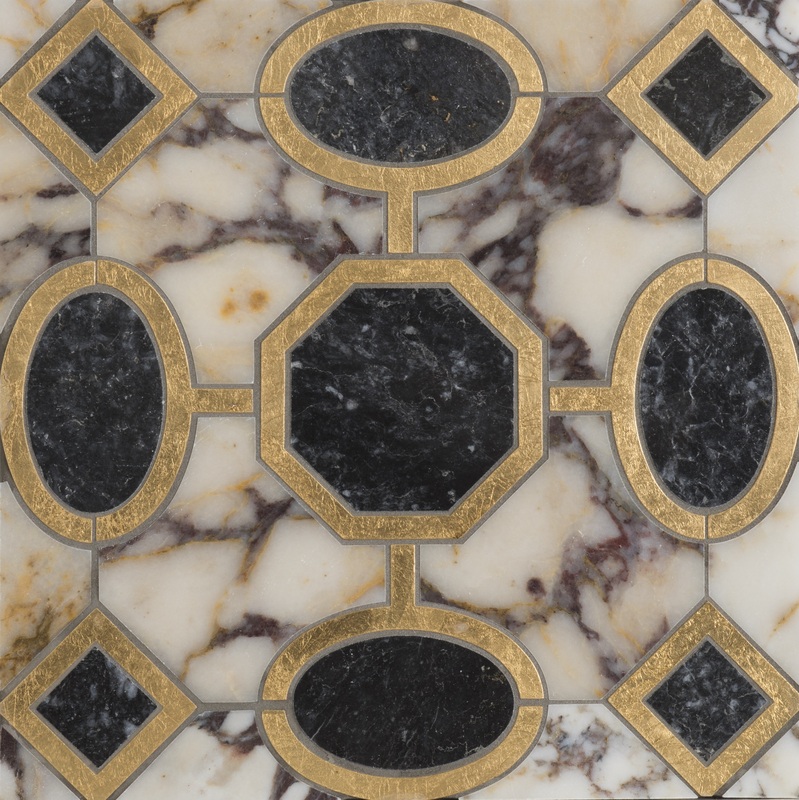 Through the Byzantium collection, we reinterpreted the lush mosaics of Imperial Byzantium and Rome to create a tile that celebrates the deep colors and rich veins of marble with accents of silver or gold leaf to elevate any contemporary interior. Ancient Rome and Byzantine Villa structures are revered for extravagant stone craftsmanship, detailed geometry and organic patterning. 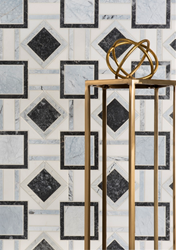 In the new Byzantium collection of marble mosaic tiles, Walker Zanger balances antique lavishness and modern geometry to pay homage to the intricate opulence of the Roman Era. Byzantium is available in three designs—Heraclee, Ephesus and Palatium—and depending on the design, include silver or gold metallic accents, and a polished or honed finish. The collection features marbles such as the vibrant Antique Violetta from Afyon, Turkey, which is a white marble filigreed with purple veins that was originally used in buildings such as the Pantheon in Rome. Agean Sea is another color, which is a blue marble latticed with gray that was also very characteristic of ancient stone work. In addition, white Thasos, deep-charcoal Storm Grey, and rich-red Borolo are deftly layered into the marble mosaics. The natural stone is cut by waterjet or stone saw, then blended into each design by experienced artisans. The combination of technology, unique patterning, and accents of silver or gold leaf offer decorative options for myriad styles and applications. Explore the inspiration and designs of the Byzantium collection by visiting its Pinterest board: http://bit.ly/WZ_ByzantiumPin. Byzantium combines antique opulence with modern geometry to create a contemporary tile collection. Shown: Gold, Storm Grey and Violetta.